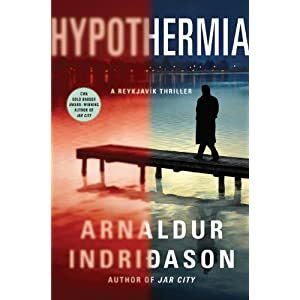 I’m more interested in Nearing Death Awareness (NDA) than Near Death Experiences (NDE), but I was intrigued by how Icelandic novelist Arnaldur Indridason used NDEs in his latest novel, Hypothermia. As you probably know, some people who have been determined to be briefly clinically dead report strikingly similar experiences when they are revived, and Near Death Experience is the term used in discussing these. In Hypothermia, things are fairly quiet for Reykjavík police detective Erlendur. He is reviewing a couple of decades-old missing persons cases, always situations of personal interest to him since as a child he and his brother were lost in a sudden blizzard and his brother was never found, dead or alive. Erlandur himself suffers hypothermia but has no permanent physical damage. Psychologically, he never recovers. When a woman finds her friend hanging from the rafters of a lakeside vacation home, Erlandur is called to the scene, but the coroner declares the death to be a suicide and there are no indications of foul play. However, the friend insists to Erlandur that Maria would not have killed herself, and Erlandur, with little to go on and no official sanction, begins to look into the dead woman’s life. Erlandur learns that Maria, along with her mother, witnessed her father drown while staying at the same lake house. After his death, Maria and her mother closed themselves off from friends and family, and when Maria married, her physician husband came to live in their home. Two years previously, the mother had died, following a long illness through which her daughter nursed her. As she lay dying, the women agreed that she would try to send her daughter a message from the afterlife. Months passed, Maria became increasingly depressed, believed she had seen ghosts, and visited psychics. Although he has no reason to suspect him of any crime, Erlandur investigates Maria’s husband’s background since the spouse is always the first person to eliminate in a suspicious death. He had studied theatre before switching to medicine. From one of his old college friends, Erlandur learned that the man had been involved in a dodgy amateur experiment along with some other med students. At this time, NDEs were first gaining some publicity. The students persuaded a theology major to allow them to stop his heart and then, after a minute or two, to shock him back to life using a defibrillator. The way that they devised to do this involved lowering his body temperature until his heart stopped, in other words, mimicking death by hypothermia. The subject would then report back to them what he had experienced while dead. Erlandur tracks down this erstwhile theologian whose life was derailed by this experiment. A once promising student, he has for years been a homeless derelict. When he was returned to life, the man brought with him no memories of peace and no visions of light at the end of the tunnel. His experience was that he had had none. I don’t know if Indridason based this tale on any real-life incidence, that is, if any group of people has tried and failed to force an NDE. It seems to me only a failed effort — one that failed in bringing the subject back from clinically dead to alive unharmed — would be discovered since the legality, not to mention the ethics, of such a pursuit would be messy, to say the least, and even with a positive result, no one would want to admit their involvement. But it raises a few interesting questions. The fictional theology student expected something, and so was devastated to have experienced nothing. Surely not everyone who has been clinically dead for a minute or two has the classic NDE that suggests there is an afterlife. Those who don’t have an NDE: what is their experience? Does their relief at being able to continue with this life mitigate unease about what being dead may be like? Do they figure that being temporarily clinically dead isn’t the same as being truly dead and so not being granted a view of the afterlife isn’t surprising? Intriguing.